I only have three children. You wouldn't think it would be difficult to spend time with each of them doing something special. Or maybe you understand completely. This summer amid family camp, 4-H class, swim lessons, overnight company, and our own little projects, I knew I needed to be intentional. My children needed to have some fun. With me. I'm not a fun parent. Really. I know you see things on this blog and you may think I am, but really, I'm not naturally a fun mom. You see the highlights here. Just the highlights. I leave the yelling sessions off the blog. What? Oh yes. Anyway, one of the things the children love to do, and I love to do with them is baking. I love to bake for my family. Of course, we all enjoy eating the fruit of our labor after baking. This summer I tried multiple times to bake with the children. Each time left me frustrated. Finally, I realized three reasons why. Big Sister. Brother. Little Sister. 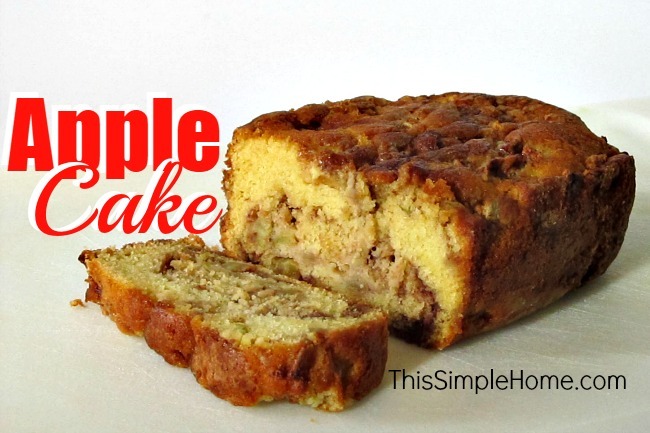 It was just too hard to bake with all three in a hands-on way, and that's what they want. I found myself irritated, and they were left wanting to help more. So I decided to invite each of the children to bake something of their choice. Whatever they chose, I would be the assistant, and they would be the chef. Big Sister (almost 8) and I made a fruit pizza together. She really has learned a lot from me over the years and did not need much help from me. Brother (almost 6) requested making apple pie together. I felt badly, but explained to him that apple pie would mean he would be the assistant instead of the head baker. (Rolling the crust and slicing apples thinly...) I suggested a few recipes we've done together. He wasn't excited about any. Then I asked him about apple cake. He was ready and excited. After Little Sister went to rest time, we were about to get to work. 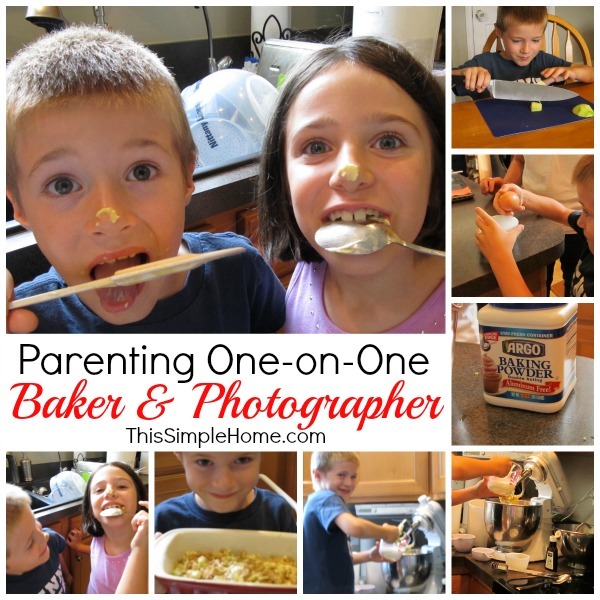 Big Sister asked if she could be our photographer during his special baking time. I allowed Brother to decide. She was thrilled to be in charge of the camera. The photographer even put dabs of cake batter on noses for the purpose of the final photograph. The baker chopped the apples, measured everything with his assistant's help, and cracked eggs. Best of all, the baker had the primary spot in front of the mixer! He loved every bit of it. The photographer took all sorts of cool blog-worthy photos...except they were mostly blurry. She had us pose, arranged ingredients, and took step-by-step photos of the process. Best of all, they BOTH felt special. Though it was Brother's time, he didn't mind letting his sister in the kitchen since he was in charge. How do you make time for each of your children (even if you have only one)? How has it changed as they have grown up? Over a Christmas vacation, I taught my child to sew. It was another way to love. With my three getting older every day and so much busier, I find that often the only one-on-one time is when I am in the car taking them somewhere. I had the thought recently that we should do Saturday morning breakfast dates, and I could take one each week out to breakfast. I just haven't started doing it yet! I have 1 child with me 24/7 but with our busy schedule of homeschooling, homesteading, working and sewing, she still feels like she is lacking the one-on-one time together. We like to have picnics! I think this was a great idea! I love cooking with my kids, but I have learned, that it is easier for my personality, to just step back and be the helper. Especially with my daughter, who wants to make her own creations. It doesn't work with her assisting me me very well because she really wants to make "her own thing," and see what happens. LOL. I also understand about it being hard to spend time with each child!! Currently, this is what I see as the advantage to my only having one child. All the loving goes on her! I don't have to figure out how to divide resources. It IS a struggle to do something one on one. I understood (and identified) with everything you wrote. Good job for trying something. Every little success adds up to a big one.